With the Christmas festivities fast approaching, we have created a roundup of the merriest dining experiences to enjoy this festive season. From traditional fare in a five-star London hotel, and a luxurious banquet in a country house, to a Cantonese-inspired feast in the heart of London, there is something for everyone this Christmas. The Arch London in Marylebone will be offering a luxurious three-course Festive menu for £35 per person from 26 November 2018 until 6 January 2019. The three-course menu includes dishes such as Beetroot cured Loch Duart salmon, celeriac remoulade; Roast Norfolk turkey with traditional accompaniments; as well as Triple chocolate, Clementine compote, clotted cream ice cream; and Bramley apple and blackberry crumble cinnamon custard. For a memorable Christmas Day Lunch, Sopwell House will be hosting a banquet in its St Alban Suite. A sparkling reception will be followed by a sumptuous four-course lunch including all the traditional trimmings. The feast will encompass half a bottle of house wine, mineral water, coffee and mini mince pies. Father Christmas will make a special appearance with gifts for the children, while live music will fuel the festive atmosphere. Priced at £169 per person, or £85 per child. 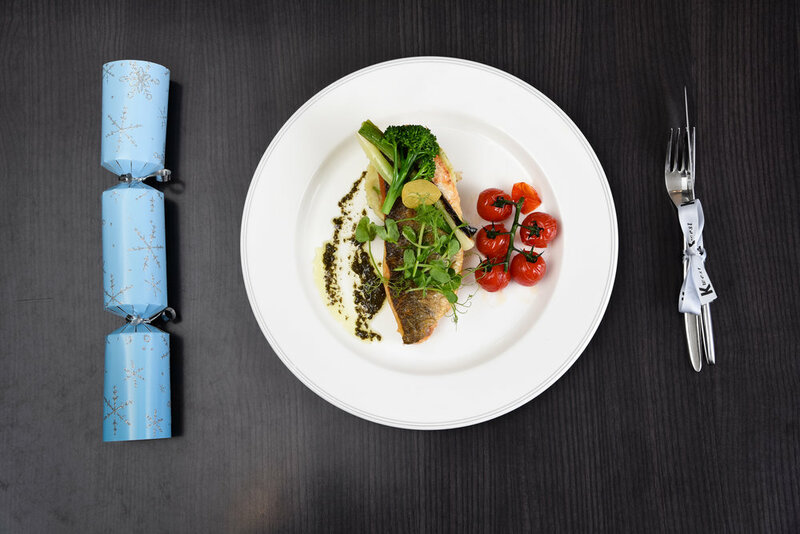 Head over to the ice-cool hotel in Shepherds Bush for a wonderful three course Christmas Day Lunch. Begin your festive feast with a choice of starters including Cured and smoked Scottish salmon with pickled peppers and caviar dressing served on Rye toast. For the main course indulge with Roasted turkey with chestnut stuffing, heritage carrots, Brussel sprouts, roasted chateau potatoes and cranberry jus. Finish the meal with a choice of dessert including Layered Chocolate mousse with mixed berry compote. Priced at £45.50. Don’t settle for anything less than magical this Christmas. With its recent £85 million renovation, Royal Lancaster London is the perfect venue to celebrate the most wonderful time of the year in the capital. Indulge in an exquisite five-course menu on Christmas Day featuring heart-warming Christmas classics such as Bronzed turkey breast with all the trimmings and homemade Christmas pudding for £75 per person. For those looking for something a little sweeter, the Festive Afternoon Tea is the essential festive treat from £39 per person, including a glass of Champagne. Enjoy a Michelin star Christmas at Bohemia at The Club Hotel & Spa with a choice of delicious festive packages suitable for a relaxing family dinner or a lavish office celebration. Bohemia is offering Festive three-course lunches from £52 per person; and dinners from £62 per person including wine and a glass of prosecco on arrival. Bohemia Bar & Restaurant provides unrivalled Michelin Star dining in the heart of Jersey. Situated on the ground floor of The Club Hotel & Spa, Bohemia Bar & Restaurant is Jersey’s finest dining establishment. With restaurants in prime locations across London, Royal China Group is offering Cantonese-inspired feasts to celebrate the festive season. The restaurants in Baker Street, Queensway, Canary Wharf and Harrow-on-the-Hill each have their own unique menus offering dishes ranging from Crispy Aromatic Duck and Christmas Hors D’Oeuvres to Diced Fillet Steak with Black Pepper, Baby Asparagus & Straw Mushroom with Scallops and Chilled Mango Pudding. Menus are available from £45 per person, based on a minimum of two people sharing.